Το Ίδρυμα Schwarz ανακοινώνει με χαρά την πρώτη του μεγάλη έκθεση στην Αθήνα, από την ίδρυση του Art Space Pythagorion στη Σάμο το 2012. H έκθεση, που θα πραγματοποιηθεί στο Ωδείο Αθηνών, φέρει τον τίτλο Ανατομία Πολιτικής Μελαγχολίας. Την επιμέλεια έχει η Κατερίνα Γρέγου, υπεύθυνη για το εικαστικό πρόγραμμα του Ιδρύματος από το 2016. Η έκθεση πραγματοποιείται σε μια καίρια στιγμή: τόσο στην Ελλάδα, με τις επικείμενες εκλογές, όσο και στην Ευρώπη, με το Brexit να παραμένει σε αδιέξοδο και με τις Ευρωεκλογές επίσης εν όψει τον Μάιο. Οι τελευταίες αναμένεται να αλλάξουν τους πολιτικούς συσχετισμούς δυνάμεων στην ΕΕ, λόγω του αυξανόμενου αριθμού απογοητευμένων ψηφοφόρων και εκείνων που δυσανασχετούν θεωρώντας ότι χάνονται οι εθνικές κυριαρχίες και αποδυναμώνονται οι εθνικές κυβερνήσεις σε μια παγκοσμιοποιημένη τάξη πραγμάτων. We are increasingly witnesses to the debasement of political language, the infantilisation and polarisation of political debate; the growth of a simplified discourse that panders to collective fears rather than addressing the real, pressing questions; the lack of accountability from politicians, and of course, ‘fake truth’ and ‘alternative facts’. Clearly there is something profoundly wrong with contemporary politics: it is not only a case of the moral and intellectual inadequacy of politicians, but also the gaping chasm between the aims of politicians and the needs of citizens. The foundations of democracy itself are at risk, not only from the rise of demagogic populism in Europe, but also from the grip of financial institutions and mega-corporations, which have the power to influence the political agenda. #Greece, of course, best exemplifies the loss of sovereignty due to debt, where ordinary citizens have been forced to bail out a country driven to financial collapse by government mismanagement. The longstanding economic and political crisis in the country has led to political disillusionment, mistrust of institutions, a sense of collective powerlessness, and a post-ideological phase characterized by apathy, individualism, and resignation. 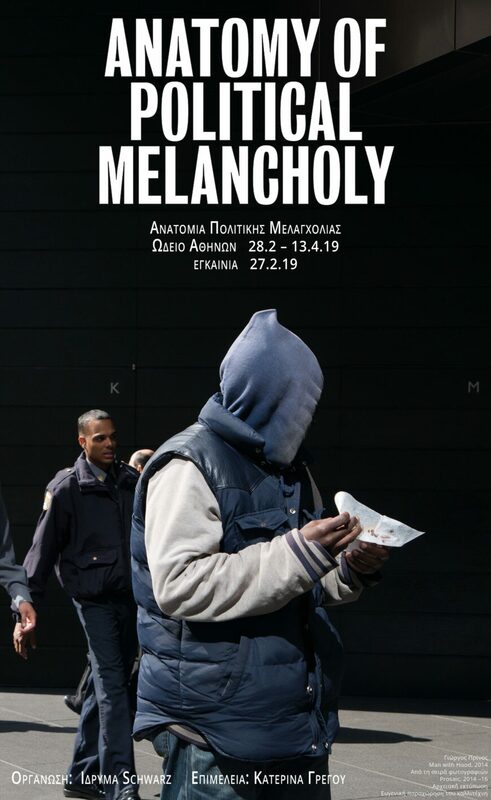 And of course, political melancholy (in Greece as in other European countries) is fundamentally tied to financial melancholy and austerity politics. At a time when ideologies tend to divide people instead of uniting them; that condemn instead of bringing about understanding and respect, the exhibition attempts to map the contemporary pathology of politics and asks us to reflect anew on our individual political responsibilities. It aspires to encourage us to reject political apathy and instead believe in the power of both individual as well as collective agency. The exhibition comes at a timely moment: both in Greece (with elections coming up in October this year) but also in Europe (with European Parliamentary elections in May – expected to change the EU’s political dynamic – and of course the continuing Brexit impasse). The exhibition will take place in the lower-ground floor space of the Ωδείον Αθηνών – Athens Conservatoire from the 28th February – 13th April. Katerina Zacharopoulou has designed the exhibition’s educational event.